Obisium (Blothrus) stussineri Simon, 1881a: 301-302, fig. 3. Blothrus brevimanus G. Joseph, 1882: 21-22 (synonymised by Beier, 1963b: 194). 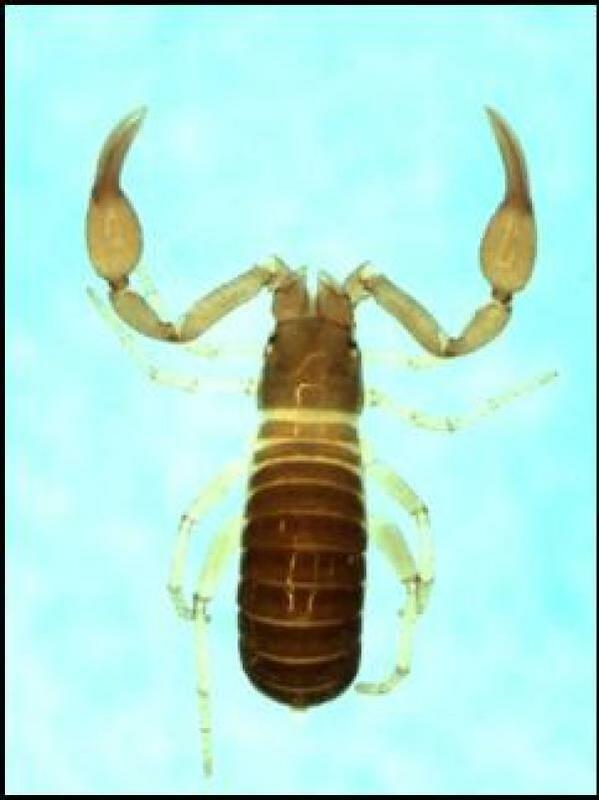 Blothrus brachydactylus G. Joseph, 1882: 21 (nomen nudum) (synonymised with Blothrus brevimanus by G. Joseph, 1882: 21). Obisium stussineri Simon: Gozo, 1908: 131. Obisium (Roncus) stussineri Simon: Bignotti, 1909: 65. Roncus (Parablothrus) stussineri (Simon): Beier, 1929d: 156; Beier, 1932a: 130, fig. 156; Roewer, 1937: 249; Beier, 1939d: 80; Brian, 1940: 401; Franciscolo, 1955: 127; Baggini, 1961: 25; Helversen and Martens, 1972: 114-115, figs 9b, 10a; Mahnert, 1980g: 100. Roncus (Parablothrus) minoius Beier, 1931d: 97-98, fig. 6; Beier, 1932a: 131-132, fig. 159; Roewer, 1937: 249; Wolf, 1938: 618 (as Roncus minous [sic]); Beier, 1939d: 81; Beier, 1963b: 191, fig. 199 (synonymised by Helversen and Martens, 1972: 114). Roncus (Parablothrus) (?) brevimanus (G. Joseph): Beier, 1932a: 135; Roewer, 1937: 249. Roncus stussineri (Simon): Wolf, 1937: 222; Wolf, 1938: 618; Gardini, Lattes and Rizzerio, 1981: 59; Gardini and Rizzerio, 1986a: 2-4, figs 1-4; Harvey, 1991a: 413; Gardini, 2000: 89; Ozimec, 2004: 388; Novak, 2005: 185. Roncus brevimanus (G. Joseph): Wolf, 1938: 616; Novak, 2005: 185. Roncus (Parablothrus) stussineri stussineri (Simon): Beier, 1963b: 194, fig. 204; Ćurčić, 1974a: 24. Roncus aff. stussineri (Simon): Ćurčić, 1988b: 71-72, figs 339-345; Dimitrijević, 1997: 111. Not Obisium stussineri Simon: Gestro, 1887: 497 (misidentification; see Roncus belluatii Gardini). Not Obisium (Roncus) stussineri Simon: Simon, 1898d: 21-22; Simon, 1900b: 594 (misidentification; see Roncus belluatii Gardini). Not Roncus (Parablothrus) stussineri (Simon): Beier, 1928: 310 (misidentification; see Roncus assimilis Beier). Not Roncus stussineri (Simon): %Pretner and Strasser, 1931: 88 (not seen) (misidentification; see Roncus assimilis Beier); Conci, 1951: 21, 25, 39 (as Ronchus [sic] stussineri) (misidentification; see Roncus troglophilus Beier). Obisium (Blothrus) stussineri: Jama pod Šmarno Goro, Ljubljana (as Laibach), Ljubljana, Slovenia. Blothrus brevimanus: Kevderza jama, , Slovenia. Roncus (Parablothrus) minoius: Katholiko Cave, near Akrotiri, Chania, Kriti, Greece, but quite possibly mislabelled (see Helversen and Martens, 1972).